Please note: Following the receipt of your hard drive, we will perform extensive testing to recover the data. Occasionally, a hard drive may require repairs in order to complete the process of testing. Repairs to hard drives are labour intensive and involve dismantling the drive, diagnosing the problems, purchasing replacement parts, and then re-assembling the drive to continue the testing or recovery. Prior to any additional costs, you will be contacted for approval and payment of the repair. iBook, PowerBook and MacBook—these are brands easily recognizable as names in Apple long line of laptop technology. Some common causes for failure of your Macbook may be an impact, water damage or file corruption. How we can help recover your files following a hard drive failure. Our clean room is well equipped to handle Mac hard drive recovery. Be it either logical or more complex physical drive failure, you can be assured of the technical ability and experience we have in safely returning your data to you. All our data recovery methods are warranteed safe by manufacturers of leading brand hard drives. You can get in touch with us online via our LiveChat and a Corporate Data Recovery specialist will attend to your needs in real-time! Fortunately we do have technicians well-versed in Apple laptop data recovery—or more specifically MacBook Air data recovery, or data recovery for MacBook Pro devices. 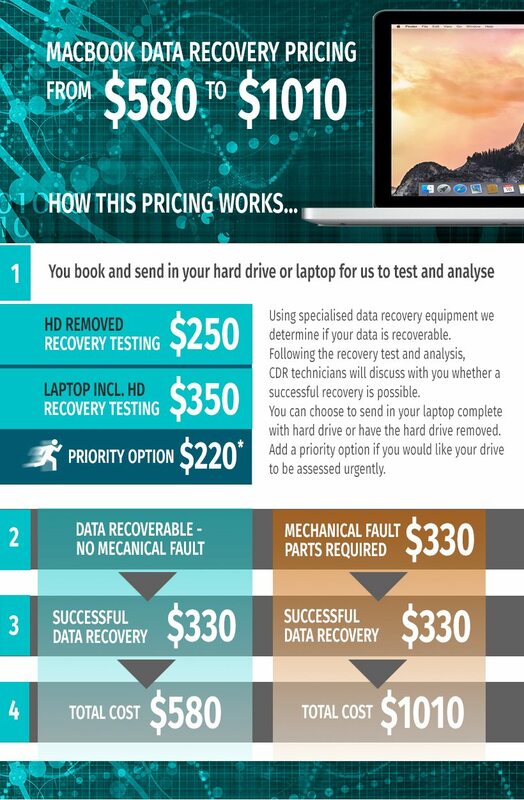 MacBook data recovery is handled by qualified technicians. We ensure that your crucial work or personal files are recovered and secured for your future use. Our specialist technicians can provide the data recovery services that you need. Corporate data recovery provides the most efficient data recovery possible and offers this service Australia wide.